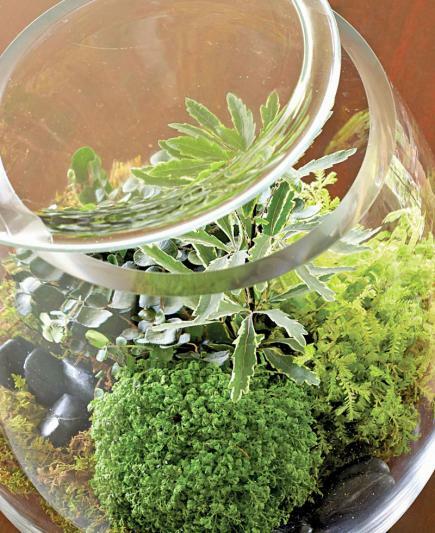 Add charming touches of green to your home with easy-to-grow terrariums. Surrounded by glass, plants almost go on autopilot—they'll get the moisture they need even in dry rooms. Click through the next slides to get some inspiration for your terrarium, and then see step-by-step instructions for getting started on slides 9 and 10. 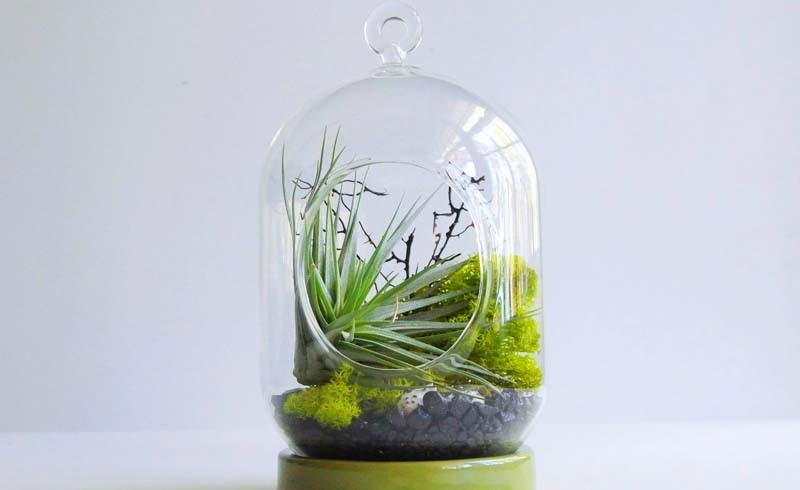 You can create a terrarium with inexpensive, everyday objects, such as a vase sealed with a glass plate (left). In our vase: pretty white-bordered variegated Dizygotheca in the middle, pale green Selaginella emmeliana on the right, a mound of Selaginella apoda at the bottom and button fern in the back left. An old-fashioned dome makes a perfect container for tall plants. 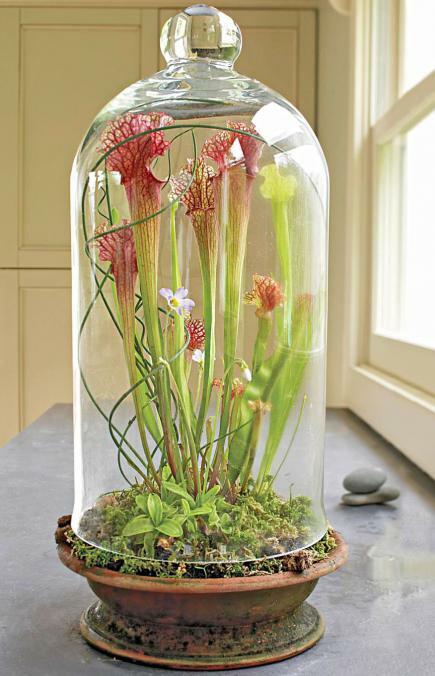 This group of insectivorous plants -- 'Scarlet Belle' pitcher plant, purple-blooming Mexican butterwort and Venus fly trap -- grows in sphagnum moss. The raised dome allows insects to enter. 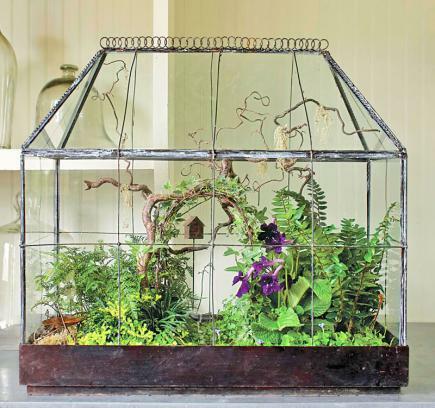 An antique terrarium becomes a stage for a miniature woodland garden, arbor and all. Ours has flowering Cape primrose, rabbit's-foot fern, golden club moss, black and dwarf mondo grasses, variegated ivy, angel's tears and Kenilworth ivy. 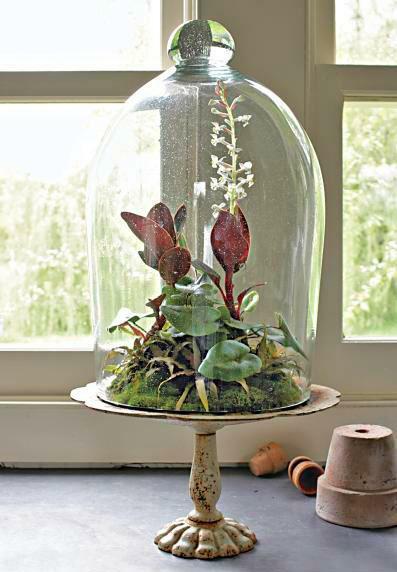 A Victorian cake stand with cloche creates old-fashioned appeal. Inside: a blooming jewel orchid, arrow-leaf ferns and small star-shape Cryptanthus 'Chocolate Stars'. Moss stabilizes and hides the soil and roots. 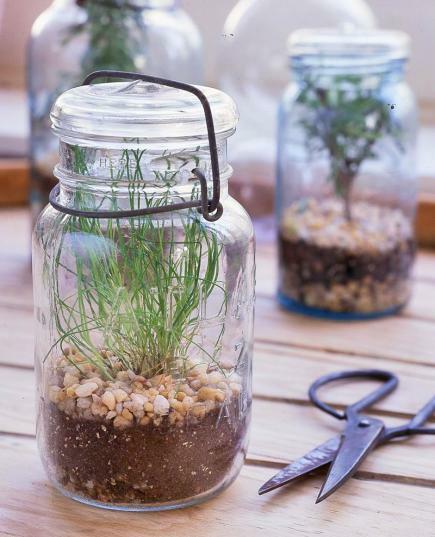 Everyday containers such as carafes and vases can make ideal terrariums. Inside(left, from left): a miniature guzmania bromeliad; maidenhair fern and selaginella; and a mix of selaginellas, button fern and variegated Dizygotheca. 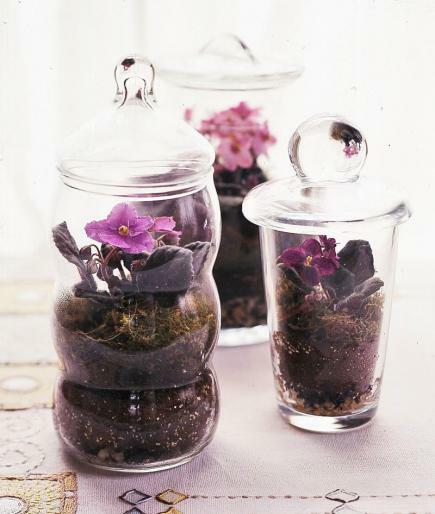 Miniature African violets (Saintpaulia) put on quite a show in small containers, such as apothecary jars and drinking glasses with mix-and-match lids. The violets' dainty size and bright, velvety colors make them glow like jewels under glass. Start with a single rooted cutting, and transplant your African violet before the leaves touch the sides of the container. 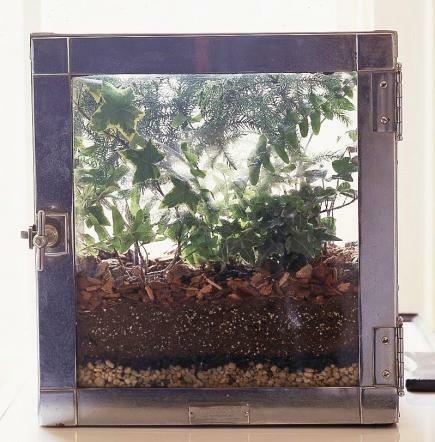 A vintage nickel barber's case makes an eye-catching terrarium. Boston ferns, variegated ivy (Hedera) and Norfolk Island pines create a woodland scene. 1. Select plants for your terrarium. 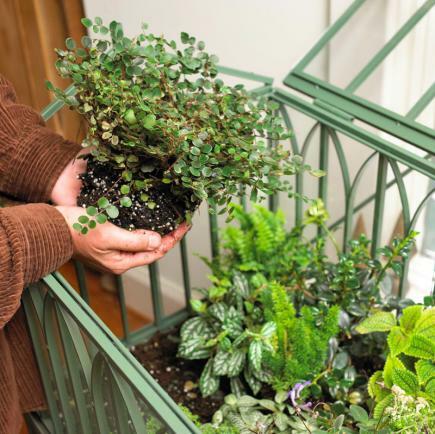 Dwarf and slow-growing plants that thrive in warm, moist air work best. Plants with different heights, shapes and textures add interest. 2. Gather ornamental accessories. Small pebbles can resemble rocks and boulders; small branches and moss give your garden a natural look. 3. 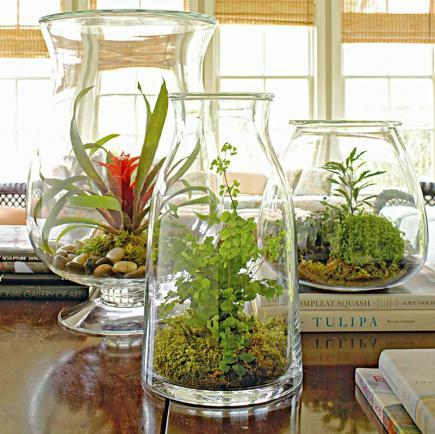 Choose a clear container large enough to hold the plants you want to enclose. Wash it thoroughly. 4. Put down a layer of drainage material, such as pea gravel. Depending on the size of your container, you'll need about a half-inch to 3 inches of pea gravel. 5. Sprinkle with fine charcoal (generally available at garden centers), which absorbs gasses and chemicals. 6. Layer 2 to 6 inches of a sterile peat-based potting mix over the base. See previous slide for steps 1 to 6. 7. Gently tap plants out of their pots. Trim rampant roots to encourage plants to grow more slowly and to more easily fit into the shallow, restricted root zone in the container. 8. 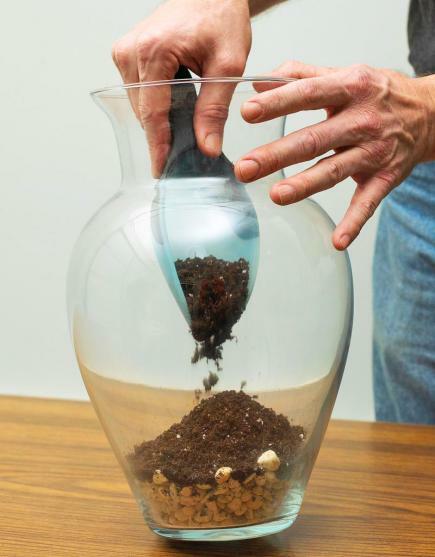 Place plants in holes and press soil gently around the roots. Use long-handled tools if necessary to avoid damaging other plants. Start in the middle and work outward. 9. Add finishing touches such as moss and rocks. 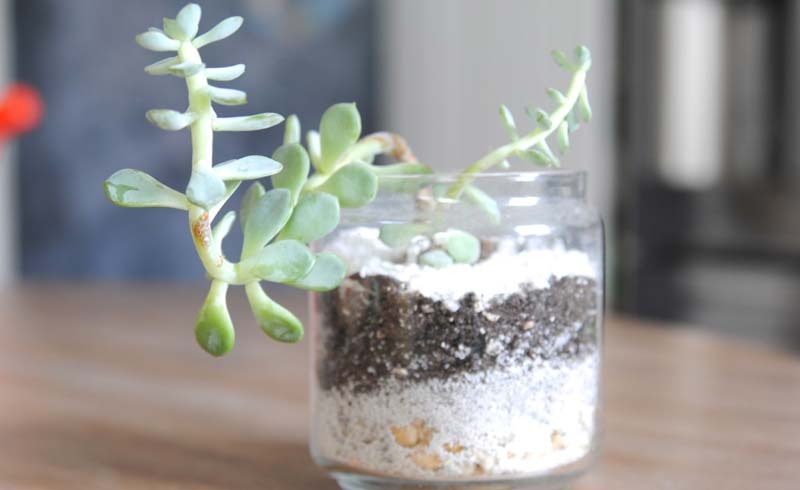 Light: Put your terrarium where it will get enough light to satisfy the plants' needs, but keep it out of direct sun, which will overheat the garden. 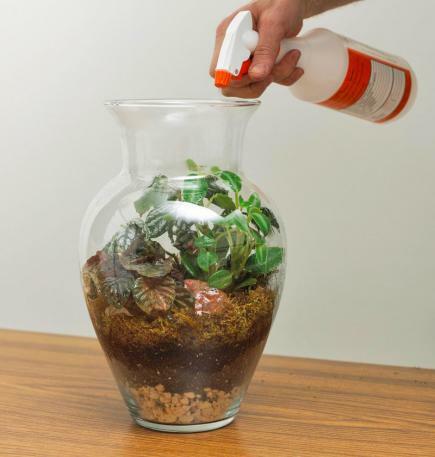 Water: Check moisture levels periodically, and mist if your terrarium needs water. Plants should not dry out, but they also shouldn't be overwatered. If spots of mold or mildew appear, your garden has too much moisture; remove or partially open the lid for two or three days to improve air circulation. Pruning: Prune plants to keep them from overgrowing their neighbors. Remove dead plants and plant parts as they appear. Pictured: Button fern, aluminum plant, Boston fern, asparagus fern and false African violet provide a variety of leaf textures and colors in this large Wardian case.